ANN ARBOR, Mich. — This Sunday, 170 aspiring physicians will step onto the stage of the University of Michigan’s Hill Auditorium, and don the short white coats and stethoscopes that tens of thousands of U-M Medical School students before them have worn. Each medical student receives a short white coat to mark the start of the path to becoming a physician. But this class will experience medical school differently from their predecessors stretching back to 1850 -- or from their peers around the country today. As part of the transformation of the curriculum, this class will experience new components that are part of this next phase of the revision, one that will continue over the next few years and will better prepare students to lead the change that’s needed in the modern world of patient care. “This is such an exciting milestone in the long history of our medical school. As our next cohort of medical students come to study with us, they will experience a new set of courses and a new direction in our curriculum, as well as an exciting, transformed space to help support their learning,” says Rajesh Mangrulkar, M.D., associate dean for medical student education. Students will be immersed in the clinical care world of the U-M Health System from their first semester, sooner than classes before them. They’ll specifically learn about the patient experience, the health care system, and how caregivers work with patients in teams to help improve their health. They will have a new “doctoring” course to help them learn the many intangible skills that physicians need, along with new opportunities to build leadership skills. They’ll be able to choose one of an expanding offering of Paths of Excellence – a way to focus their passion in areas such as ethics, health policy, global health, medical humanities and scientific discovery. They’ll have more chances to learn about, from and with students enrolled in U-M’s other health professions schools, including Nursing, Dentistry, Pharmacy, Public Health, Kinesiology and Social Work. They’ll each get “sorted” into one of four new houses within the M-Home, the learning community newly launched by the Medical School to build ties among classmates, members of other class years and dedicated faculty advisors and coaches, as a way of fostering their learning and professional development. They’ll have access to an entirely new and much larger medical learning space, in a renovated Taubman Health Sciences Library opening with the start of the medical school academic year. He and Joseph Kolars, M.D., senior associate dean for education and global initiatives, have led a team of over 300 faculty and students who have worked for over 2 years to develop the new curricular model. The Medical School faculty approved the full transformation plan in June, including the “trunk and branches” architecture that will allow students to develop advanced skills and knowledge within clinical domains; along with many competency-based aspects and assessment protocols that focus on students’ ability to master key skills. The idea is for graduates to be as ready as possible for their eventual residency training in the field of medicine they choose, and be able to lead the future transformation of health, health care, and health care science that patients need. The new curriculum planning process was fueled in part by a $1.1 million grant from the American Medical Association as part of its 11-school Accelerating Change in Medical Education initiative, and by a $6 million investment by the U-M Office of the Provost and other U-M health professions schools to create a new Center for Interprofessional Education. The $55 million investment by the Medical School in the Taubman Health Sciences Library renovation represents part of the significant investment by the school in the curricular transformation initiative. For more about the new curriculum, visit http://curriculum.med.umich.edu. 5,726 people applied for a spot in this year’s class. Only 538 made it to the interview stage – which was an even more selective round than last year. 55 of them attended U-M as undergraduates, with the rest graduating from 12 other Michigan institutions and 57 out-of-state institutions. Nearly 56 percent are women, and 15.3 percent are members of groups underrepresented in medicine. Nearly 60% of incoming students have biological, natural or physical science backgrounds. But the rest come from many diverse fields including engineering, business, economics, humanities, policy and the arts. More than 55 percent received some form of financial aid. 9 students will pursue both an M.D. and Ph.D. degree through the Medical Scientist Training Program. Three who already hold dental degrees will train in oral & maxillofacial surgery. Many others may choose to pursue a second degree at other U-M schools, through any one of the eight dual-degree programs open to medical students. The students range in age from 20 to 36, with the average at 24.3 years. 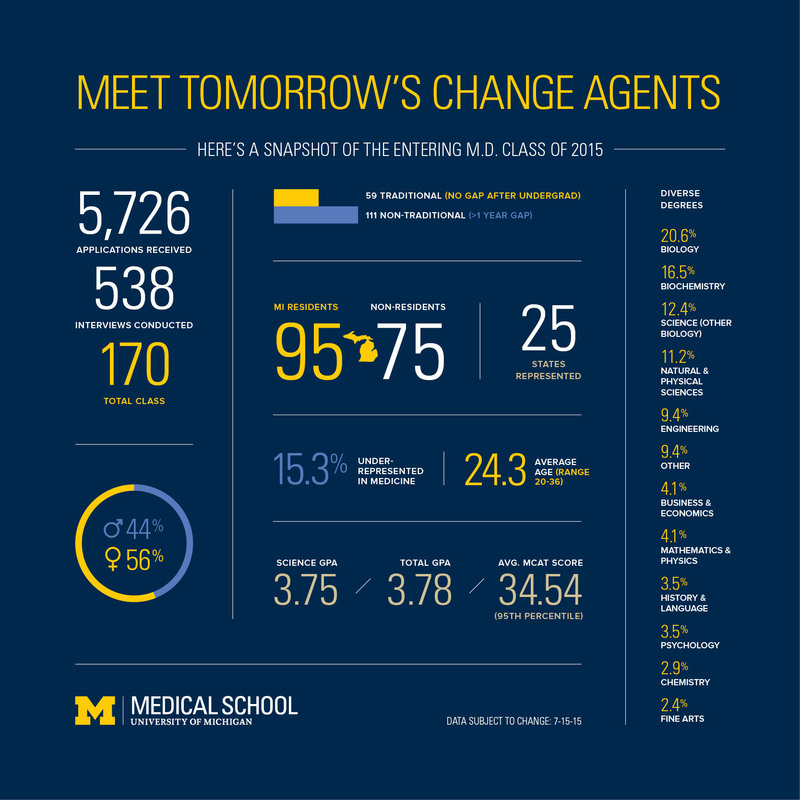 To see the full 2015 entering class profile, visit umhealth.me/ummscp15 .